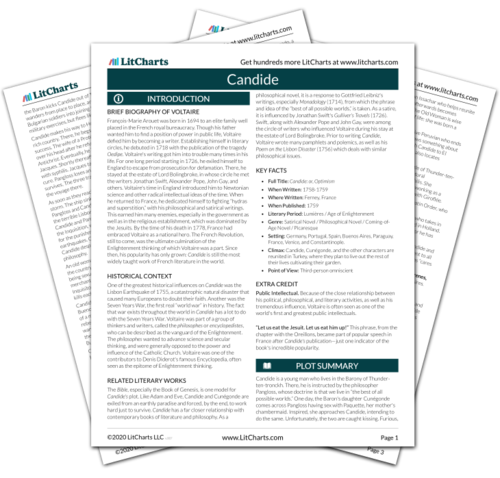 Instant downloads of all 945 LitChart PDFs (including Candide). At a Venetian inn, Candide and Martin sit down for dinner with six strangers. There, a slave approaches Candide privately and reveals himself to be Cacambo. Cacambo tells Candide that Cunégonde is in Constantinople, and reassures him that they will set out to free her just as soon as dinner is done. As always, Cunégonde is tantalizingly close, but still just out of reach. Cacambo, as it turns out, did not steal the money and is still loyal to Candide. The six strangers introduce themselves. All of them claim to be deposed or exiled kings who have fallen on hard times, and who have come to enjoy the carnival in Venice. Candide and Martin suspect that this must be one of the masquerades of the carnival. In Candide, almost everyone is an unfortunate “nobody,” who was once a “somebody.” This theme, common to literature of the time, is mocked in this scene: it is ridiculous that six exiled kings should all end up together, by accident, in a Venetian inn. Lucas, Julian. "Candide Chapter 26." LitCharts. LitCharts LLC, 16 Sep 2013. Web. 2 Feb 2019. Lucas, Julian. "Candide Chapter 26." LitCharts LLC, September 16, 2013. Retrieved February 2, 2019. https://www.litcharts.com/lit/candide/chapter-26.